Fate/Stay Night is available on iOS and Android and you can get the Fate path for free. Apparently someone felt there was an untapped market for Fate/Stay Night characters a plush rice cakes. I suppose you can’t complain that they are trying to push too far into the crowded “characters as plush rice cakes” market. They also taking orders for Shiro’s jacket. I just linking to the supplemental Fate/Grand Order post I did in case anyone missed it. A list of the voice actors and actress that have been announced for Fate/Grand Order. Siliconera also has an article on the Fate/Grand Order update. Caster and Souichirou are on the cover of the 7th Unlimited Blade Works rental DVD. She will never be able to join the Technocratic Union. Thew news that Noriko Shitaya is getting married has led to some nice artwork. 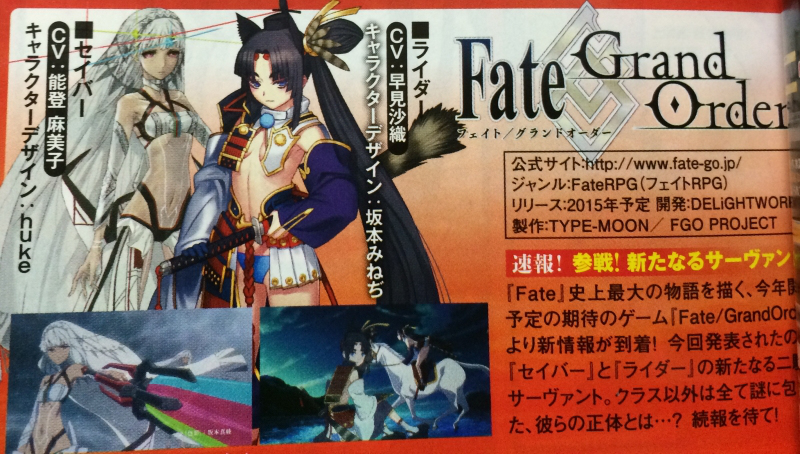 There is also a new Rider being introduced in Fate/Grand Order. I don’t know much about her besides that picture. Are Your Feeding Me a Line? Line is now offering stickers for Unlimited Blade Works. Some of them distinctly … subvert the dignify of the characters. With a Real Action Heroes version of Nero Saber. Such is the Illya path.